Whywait Plumbing are your Gold Coast stormwater drain specialists, maintaining stormwater drains and clearing blockages for over 40 years. When severe summer storms arrive or the increasingly common east coast lows you understand and appreciate your stormwater drains. Whywait Plumbing are your Gold Coast stormwater drain specialists, maintaining stormwater drains and clearing blockages for over 41 years. When severe summer storms arrive or the increasingly common east coast lows you understand and appreciate your stormwater drains. These weather events can see us receive more than 100mm of rainfall in an hour which causes flash flooding. Maintaining your Gold Coast stormwater drains is critical to prevent the possibility of rainwater infiltration inside your home or business premises. You cannot redirect your stormwater runoff away from your property and adversely effect neighbouring properties. It is your responsibility to manage rainwater that falls onto your property. Like most of our plumbing infrastructure, stormwater drainage systems are mainly out of sight. Sadly they are always out of mind too until it’s pouring down with rain and your Gold Coast stormwater drains fail to work. Legally you are responsible for maintaining all of your stormwater drainage infrastructure within your property. This responsibility includes the kerb adapter connections out on the street or the connection into a council collection pit. Remember the stormwater drainage infrastructure is all encompassing from the roof right through to the discharge points into council infrastructure. Every bit of water that flows from stormwater off your roof, paths, driveway, gardens, and lawns goes into council stormwater drains that connect to local creeks and rivers that all flow out to sea. 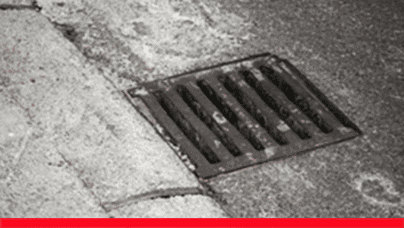 Maintaining your stormwater drains is simple so don’t wait for a disaster to unfold when it’s pouring rain. A stormwater drainage maintenance carried out annually potentially protects your family, your local environment and your local waterways. Above all, it helps eliminate the costs of emergency repairs and ensures your drains have the capacity to handle summer storms. Talk to us today about a maintenance program for your stormwater drainage infrastructure that starts with your roof. As we all learn the hard way, “prevention is better than the cure”. Simply the proverb means it’s easier to stop something happening in the first place than to repair the damage after it has happened. Where blocked or broken stormwater drains are concerned there is not a cure, just a heap of pain in the hip pocket.